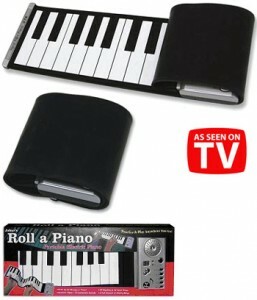 This portable roll-A-Piano can be rolled up and taken with you, making it a good option for people that want to keep practising piano but do not have the room to store either a piano or an electric keyboard. The item includes a speaker which the rest of the piano wraps around when it is rolled up. It is located on the far right hand side of the keyboard, the greyish thing. That is the same area where the batteries are inserted and there is also a headphone outlet there, which is a nice addition as generally those that wish for a portable piano are probably going to use it in constricted areas and apartments where they will need to keep things quiet. It also features 99 Rhythms and 16 instrument sounds, making it a fun gimmicky product. Personally I think those types of things sound awful and are more of a nuisance, but children tend to really enjoy mucking around with them. One of the major negatives with the product is that it can sometimes require a flat surface to play. Something to do with how the power is distributed to the keys or from the keys. Unfortunate, because otherwise it is a nice if gimmicky product.